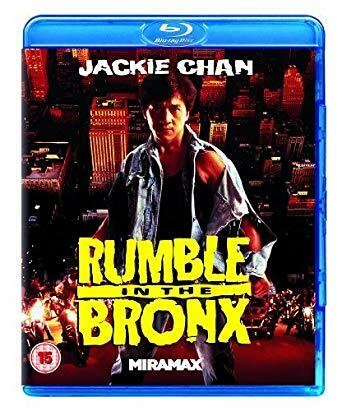 Jackie Chan movies have been poorly served on the Blu ray format, in the West only a couple of titles have been released and those mainly cut and dubbed and the discs released in Hong Kong have been of poor quality so its great to report that this Blu ray of Jackie’s Western breakthrough hit Rumble In The Bronx is good, with a few reservations. 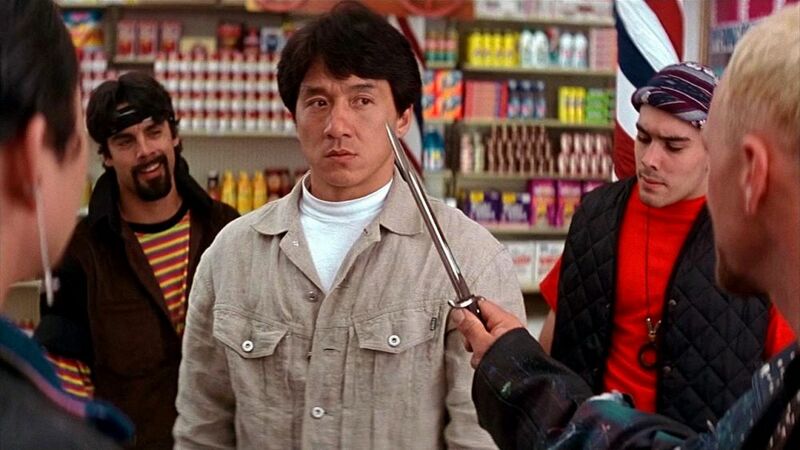 The plot as such is pretty poor, Jackie (Keung) comes to New York (filmed in Vancouver) to help with the sale of his uncle’s supermarket but comes across a gang of thugs who terrorise the store, but Keung is determined to show the gang that he’s not about to be pushed around. Things get even more sticky when the hoods are on the trail of a lost cache of stolen jewels and the police become involved leading to a big showdown. Director Stanley Tong keeps things moving at a brisk pace and the action when it comes is top grade, Jackie is in superb form performing some great stunts as well as staging some imaginative fight scenes. A few fans moaned that the film didn’t end in a big fight scene but the reason was that Jackie broke his ankle doing a jump onto a hovercraft so they had to think of a new way to finish the movie. As usual painful outtakes are shown at the end of the film. The Blu ray released by Miramax has a good solid 1080P transfer, colours are good but black levels are a bit high as if the contrast was boosted too much. The sound is in English dubbed DTS 5.1., as most of the film was shot synch sound English anyway this causes less of a problem than some of his other films such as Drunken Master 2, although when it is obvious that they are speaking Cantonese the dubbing can be a bit jarring. One of the disappointments, but no surprise, is no inclusion of the longer Hong Kong version. Lots of cuts were made for the International release, mostly dialogue and it would have been nice to have seen it included as an extra at least. Talking of extras there are none. nope, not even a trailer. Finally, this UK Blu ray is the full international version. On the original DVD release the scene with the bottles in the ally-way was cut by around 40 seconds by the BBFC, but thankfully it’s uncut here. So overall a good release and recommended, very good picture and sound quality, just a shame about the lack of extras. The Blu Ray is locked to Region B.